Gosford, just an hour's drive north of Sydney, on the New South Wales Central Coast, offers a large number of inns, motor inns, motels and holiday apartments. Only one Australian chain, Metro Hospitality Group, has a presence. Nearby at Terrigal is the Coast's premier hotel the Crowne Plaza Terrigal on Sea. 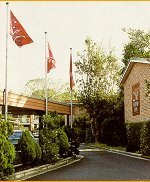 Another Australian chain, Country Comfort, has a motel at Terrigal. On the beautiful Central Coast of New South Wales, the Metro Inn Gosford is the ideal location to help you explore one of Australia's renowned leisure areas. After a visit to the Australian Reptile Park and Old Sydney Town, or a trip to the beach, relax in our landscaped garden courts and patios, swimming pool or spa. Rates are in Australian dollars, include applicable taxes, and are per room per night. One or two adults can share a room, also 2 children up to 12 years of age are free. Additional adults are $22 per person. Rates are subject to availability. (Excludes event dates) When making contact be sure to apply for the 'Special Internet Rate'. To access this rate you must contact the property direct.